Today’s cow is making human milk? My husband is helping us catch up on missed episodes of The John Stewart Show and Colbert Nation this week and tonight we got to watch the June 20, 2011 episode of Colbert Nation. About 6 minutes and 30 seconds into the show, Stephen Colbert introduced a news report that instantly made me go, huh??? Apparently some scientists in China have been working at genetically modifying cows so their milk closely resembles human milk. Yes, you heard this right. Cows making human breastmilk. Well, almost (80% similar). 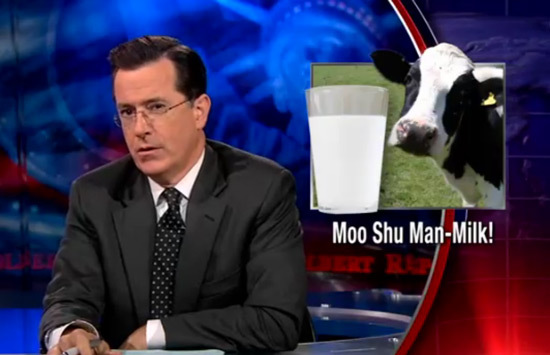 I invite you to watch this segment of Colbert Nation. Warning: some scenes are quite graphic (they involve the not-so-classy treatment of dairy cows) while others are very funny, so watch at your own risk! Now, I really, really thought this was a joke. Seriously, how could this be possible? So I googled the news item and it seems to be for real, according to this more official report from CBS News. And it’s not happening just in China but also in Argentina. Wow cow! Would you drink milk from genetically modified cows if it was more like human milk? Would you let your kids drink it? Is science going too far or in the right direction? Next Post Looking for cow decorations for your kitchen? How about cow burner covers? I had heard about this, too. I believe breast milk is for babies….NOT for everyone. Eww! No thanks for me! I’ll go completely on Soy Milk if this catches on! its all about make healthier food for our children.